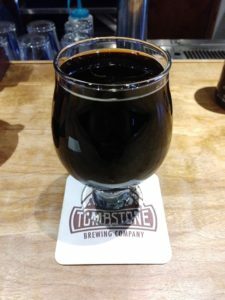 Tombstone Brewing Company has garnered a significant reputation, seemingly overnight, for producing great beer. They’ve been in operation only two years, but time and again, I hear people rave about their beer. In fact, after only three months of operation, they nearly cracked Untappd’s Top 50 Breweries list. 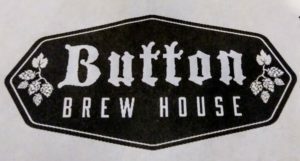 Button Brew House is located at the end of Camino Martin Road. You have to turn south at Ina and the Chicken Nuevo. In the dark (it was about 9pm when I made it to Tucson) it looks very sketch. There are virtually no street lights here, but after about ½ mile, the road opens up a bit. You turn the corner and come upon a well-lit parking lot and a series of warehouse buildings. Button is at the end. For the size of the building, Button’s taproom appears to be fairly small. When you enter, the first thing you see is a small seating room. You must go to the back of the building to reach the taproom. Once you get there, it’s all good. The bar seats perhaps 15-20 in a grand “L” shape. There are two tables for additional seating. The décor is minimal; the walls contain logos for Button and posters for their beer. >The Volstead Pilsner is legit. On Untappd, I wrote, “Malty sweet without killing the crispness. Great looking beer.” It was so good, I got a growler to go. >The Chiltepin Red was hot…I mean spicy hot. 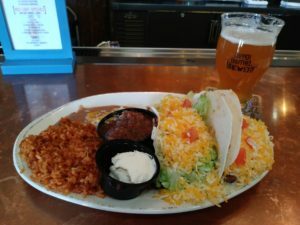 My notes on Untappd were: “Imagine McFate’s Hatch Chile Gatos…on fire.” Almost like trying to eat chili powder without water. Whew! Spicy. My one regret here was that Button closes at 10pm on Friday nights. I get that their location limits potential foot traffic but closing at 10pm is kind of a bummer when you drive from Phoenix to get there. Nonetheless, I took my growler back to the hotel room. At Ina and I-10 there are plenty of budget hotels for a quick night crash. Take your pick. The next day, I headed south toward Tombstone. I decided to take “the long way”—through Sonoita. Sonoita is one of the state’s official viticulture regions—known for wine making. 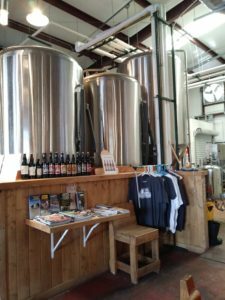 Why take a diversion through wine country on a beer trek? Three words: Copper Brothel Brewery. Sonoita is a small town. A “no stop lights, only stop signs” kind of town. Until last year, the “center of town” in Sonoita was basically the intersection of routes 82 and 83. On that corner, you will find a gas station, Dos Cabezas WineWorks, and the post office. All the wine making and tasting rooms spread out to the south of town. 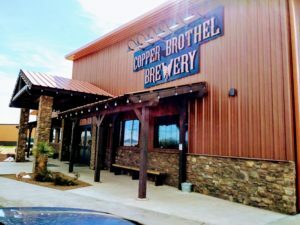 Copper Brothel Brewery’s opening in 2018 essentially makes them new the center of town. They are only about ¼ mile from “the intersection,” but their presence is making a monumental impact on the place. I rolled into Sonoita about 11:30a. It was getting hard to find a parking spot. Inside, I took a seat at the large bar, but tables were filling up. By 12n, every seat in the place was taken. Bikers, wine tourists, beer tourists, international tourists and likely a few locals were all clamoring for a seat. Copper Brothel is a full-service restaurant, which is part of the attraction for certain. Last time I was in Sonoita in 2017, dining options were severely limited, and Copper Brothel is an enormous improvement. I had the two-taco plate (outstanding). But they do make their own beer too and that’s what’s important here. Copper Brothel brews a full lineup of house beers: a gold ale, a wheat, a stout, a porter. Of particular note here is the “Roxie’s Code Red Kolsch.” Kolsch’s are a hybrid beer, made from ale yeast but conditioned cold like a lager. The result is usually a bright yellow, clean, clear, mildly malty beer. 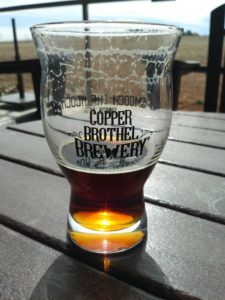 Copper Brothel tweaks this traditional process by throwing in diverse malts, which results in a sweeter, redder, and absolutely fantastic beer. You get clear toffee and caramel notes here with maybe some dark fruit. Imagine a Fuller’s ESB with more mouthfeel and a tad sweeter and you get the idea. I would have had more, but Tombstone was calling. My first stop upon arriving in Tombstone was getting my lodging set. My plan was to get my room keys and head out into town on foot. Tombstone is small--easy walking distance. I lodged at the Sagebrush Inn, about two blocks north of the main drag and four blocks from the brewery. There are no chain hotels in Tombstone, which might give some folks pause, but Sagebrush was perfectly fine. 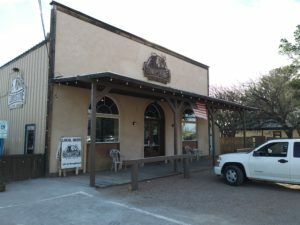 I headed to Tombstone Brewing around 4pm. The building itself is remarkably simple. Barely two stories, sheet metal sides and roof. The front reminds one of the old livery buildings that adorn most western art. Word is, the building used to be Tombstone’s city hall. The inside of the taproom is quite simple, with wood furnishings seemingly assembled from spare 2x4s. Behind the bar, which seats maybe 12 people, is an enormous mirror, befitting a western town bar. The taproom shares the space with the brewing floor. Although there’s a lot going on, it never feels too cramped or crowed. There’s patio space out back and on the side. On this visit, I stayed close to the bar. On to the beer. In most cases, it was good. Very good. In one case, it was glorious. I started with “All the Hops” which is just like it sounds: a brew made of all the hops they had on hand. Strange as it sounds, it works. As you might imagine, there wasn’t one specific flavor or aroma that stood out. Just a wonderfully gooey brew. Next, I tried the Dank Fruit IPA. John Morgan, who was behind the bar, noted that they had just canned this earlier in the day. It couldn’t be fresher. So, I opted for a taste. I traditionally don’t like dankness. I give it a try every now and then. I just don’t get excited by the flavor profile in general. Same with Tombstone's version. Dank is dank. It was well done, but this did not do much for me. 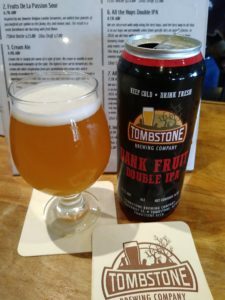 Juicy IPAs and hoppy beers seem to be Tombstone’s wheelhouse. So much of what they do revolves around IPAs and bright, hoppy flavors. So, I opted to go the opposite direction and taste their Imperial Stout. They were serving both a traditional brew and one aged in Calvados/brandy barrels. I went with the barrel aged, and I’m glad I did. This…was…unbelievable. 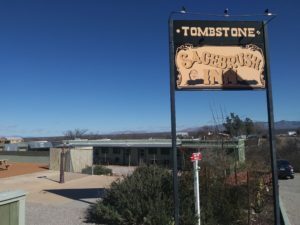 If visiting Tombstone Brewing is a required pilgrimage, consider the Calvados Stout as Mecca. Or Nirvana. Or Heaven. At 10.5% ABV, it’s fairly mild in terms of the alcohol, but the flavor comes across as a roasty dark sweet molasses. Or maybe if a bunch of prunes went on a bender of brandy and cognac and fell into a stout wort. Either way, this was dynamite. I should have taken a bottle home and aged it further. Oh well…save that for another pilgrimage. In Tombstone, after sunset, the tourists go home and the locals come out to party. 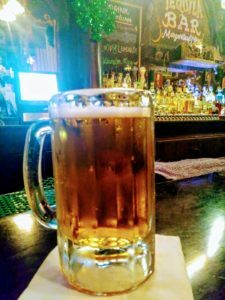 Tombstone Brewing closes at 7pm every day so you’ll have to find other drinking options in town. There is no shortage of saloons (yes, working saloons) in Tombstone. I took a quick tour of three and “Big Nose Kate’s” is the one to visit. If you are in the touristy mood, Big Nose Kate’s has all the trappings: dimly lit room, stained glass windows advertising “the goods,” servers in period dress. The beer is cheap too. I scored a Biltmore Blonde for $4. The other saloons didn’t have much going on: Four Deuces was small; Crystal Palace was big, dark, and mostly empty. They are all within easy walking distance from each other, so take your pick. The next day, it was time to return to Phoenix. 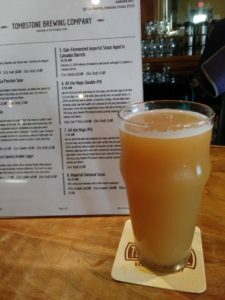 I had made my pilgrimage and seen first hand why Tombstone Brewing is, in the words of so many bartenders I know, “killing it.” Their beer is creative, flavorful, and drinkable. Word is that Tombstone’s current client list is 110 members long. That may not be so impressive, but what is impressive is that their waiting list is 10 times as long. People want their beer. And if you can’t find it locally (you should), make the trip to Tombstone. It’s worth it.